Have you been circumcised? A Happy New Year Deal! Whether or not you have, I bet you’ll more than enjoy hearing Reform-then Conservative-then Orthodox Jewish convert and Italian-Irish American comedian Yisrael Campbell telling you about the THREE circumcisions (“a fetish!,” he says) and three conversions that made him the Jew he is today. 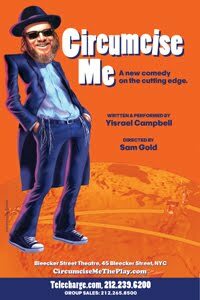 Below is the trailer for the film “Circumcise Me.” Campbell is currently doing an off-Broadway version “Circumcise Me, the play” at the Bleeker Theater. If you go this Sunday, you’ll see me there! Go to Broadwayoffers.com use the code CM25. It’s $25 a ticket (plus 1.50 facility fee). Ring in the new year with some fresh jokes!